Today we would like to introduce to you International Master Teimour Radjabov. 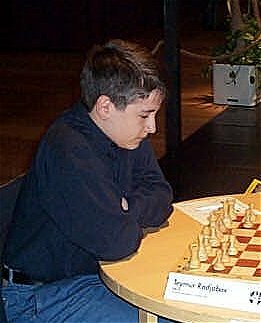 In the December 2000 First Saturday GM Tournament in Budapest Hungary, this 13-year old boy convincingly won the tournament with a score a full point above the GM-norm. Teimour is a very serious and balanced person and we predict a very bright future in chess for him. Soon he will play in the ÎBâ tournament in Wijk aan Zee and it will be very interesting to see how he fares there. Here is an interview conducted by GM Baburin on the 15th of October 2000 on the Faeroes Islands. This interview was originally published in Chess Today. Teimour, when and where were you born? I was born on the 12th March 1987 in Baku. Do you really think that at this level a computer can help you? No, but it is hard to find a suitable coach, mistakes can be costly. How do you work on chess? Usually I study chess for about 7 hours a day. I analyse my games with computer, check chess periodicals, particularly those openings, which I play. I just finished reading book on the Candidate Tournament in Zurich 1953 by Bronstein — great book! I also study game collections and recently looked at Petrosian’s, Capablanca’s, Alekhine’s and Botvinnik’s. What about modern players? Who are your favourites? I like how Kasparov, Kramnik and Shirov play. I like active play. Probably winning the European Junior Championship under 18 in 1999, when I was 12.
Who are your main rivals, whom you’d like to overtake? I would like to overtake Bu, Ponomariov and Grischuk. Do you prefer to play with juniors or with adults? With adults. Among them there are many strong players, from whom I can learn. Who is the strongest player you have ever played? When you look at games of the so-called chess elite, do you see a difference? Yes, the difference between Kasparov, Kramnik, Anand or Morozevich and somebody rated even 2640 is very considerable. What attracts you in chess? Atmosphere of the tournaments and desire to prove that I can play better than my opponent. You played here and could see that despite so many GMs participating, we hardly had any spectators. Many people believe that chess needs shorter time control. What do you think about it? I think that to replace classical chess with just rapid chess events would be a disaster. Rapid chess events should exist alongside tournaments with classical time control. Yes, I have already been to 16 different countries. What is your favourite country and city so far? I like reading, soccer and tennis. Do you plan to become a professional player? I would like to become a Grandmaster and raise my rating. Well, Teimour, good luck with your plans — I hope that you will achieve them! The positions above occurred during games played at the Budapest tournament mentioned at the top of the page. Take your time, think about it, then refer to the answers below. Problems and interview were originally published in Chess Today.